In a pressure cooker add carrot, beans, sweet corn, oats, water and salt. Cook in medium flame till a whistle and switch off the gas. When the steam releases open the lid , add milk and switch on the gas. When it reaches boiling stage season with pepper and salt before switching off the gas. 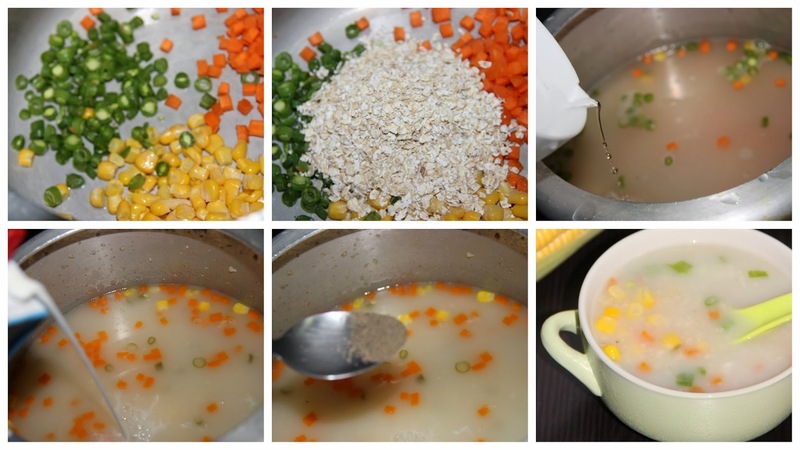 Note: If you did not get sweet corn add normal corn along with a pinch of sugar in that soup. If you like more milk in the soup increase the quantity of milk added to ¼ cup. You can add chopped cabbage or spinach as well if you wish to. very delicious soup :) first time here you have a wonderful space :) do visit my blog too and wud be glad if you follow me back !! very healthy soup and lovely pictorial as well.